EVEN before the arrest of Gerry Adams, his party was facing into what is arguably one of the most tactically important elections it has ever fought. The political tension of the past week has centred in Northern Ireland, but the party will spend the next 48 hours testing how the fallout might affect its levels of support in the Republic. A Monday night election rally in Belfast will be followed by a similar event in Dublin on Tuesday, after which strategists will have a better sense of where the party stands. Sinn Féin faces a string of elections on both sides of the border – local council and European elections on May 22 in the north and in the south on May 23 – but arguably the most important are the local government elections in the Republic. A senior Sinn Féin source speaking ahead of the latest controversy linked the south’s local elections to the strategy for growth that the party mapped-out seven years ago. In 2007 Sinn Féin successfully entered government in the north with the DUP, but suffered the collapse of its ambitions in the south’s subsequent general election. It was a major blow to republicans. In a previous interview with The Detail, Gerry Adams spelt out how Sinn Féin went back to the drawing-board. “What we basically did was try and prepare the ground to ensure that that never happened again," he said at the time. The party has thrown everything at the cause. Gerry Adams moved south to take a seat in Dáil in 2011 alongside a new crop of Sinn Féin TDs, before the party sought to boost its profile again by running Martin McGuinness for the presidency. The hope to create that “rootedness” is why the local government elections in the south could be so tactically important. The presidential contest helped identify new pockets of potential support. Sinn Féin is now fielding its biggest ever panel of candidates in the local elections, with 350 contesting seats across all 42 councils in Ireland north and south. The party’s sitting MEP in Northern Ireland is tipped to top the poll, while surveys place its three European election candidates in the Republic in a strong position. Success in the local elections in particular could give the party a bedrock of grassroots representation to build upon for the next general election in two years. So this month’s election results represent an important strategic stepping stone. Sinn Féin sources have said some of the high opinion poll ratings it has seen in the south probably overstate its true level of support, but they feel they are on an upward trajectory. In the mouth of this key election, when those poll figures will be put to the test, the Sinn Féin President was questioned for four days by detectives investigating the IRA murder in 1972 of widow Jean McConville. 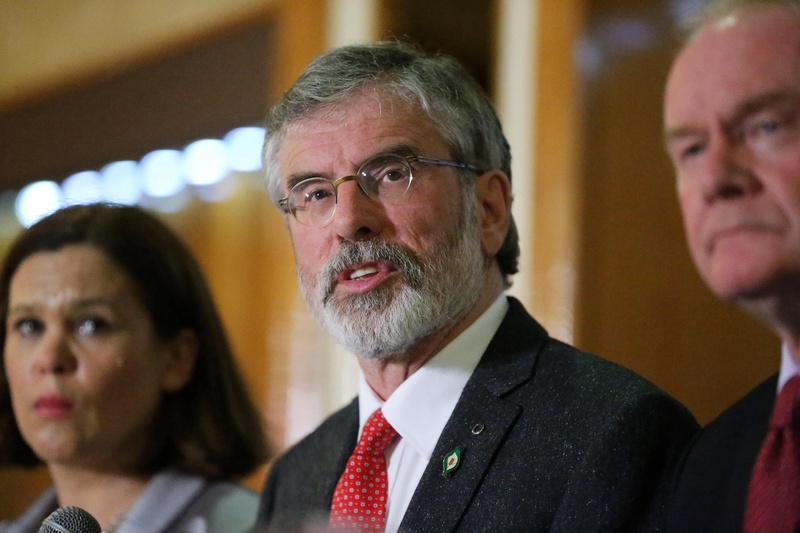 Only six months ago Mr Adams’ international reputation reached a new high when he was invited to join a guard of honour at Nelson Mandela’s funeral, but he spent most of last week sleeping on a rubber mattress on the floor of a police interrogation cell in Antrim. The high profile arrest followed years of public controversy sparked by the claims of former republicans linking Mr Adams to the Jean McConville killing. The Sinn Féin leader noted that the police decision to send a file to the Public Prosecution Service means the issue has not yet run its full course, but his rejection of any involvement has ended with him being released from custody without charge. Sinn Féin remains highly critical of the police handling of the episode in its public remarks, but its private focus may shift now to gauging how this reminder of the Troubles has registered with potential new voters in the south. As was reported in The Detail prior to Mr Adams’ release, the party is likely to have scoped-out the political options available for all eventualities, with its top priority the protection of its longterm ambitions in the south. There is an expectation that Sinn Féin wants to challenge for a role in government in Dublin at the next general election due for 2016. But some suggest it may instead aim to establish itself as the main party of opposition and build towards a stronger political position for the general election at the end of this decade. It faces a tough task in what is a volatile and complex political arena and the party has suffered defeat in the past. In the press conference that followed his release, Mr Adams spoke of “bumps on the road”, “diversions” and “obstacles” ahead. He was flanked by three Sinn Féin government ministers from Stormont, and three TDs aspiring to high office in Dublin.